Going for a run in the sweltering heat, then jumping into a body of water, and then continuing to run might seem like the recipe for a yeast infection, or at the very least some high-intensity chafing. But that is exactly what you're supposed to do in these new Tracksmith running shorts, aptly named the Run Cannonball Run Shorts. Okay, we're being a little dramatic. Taking a dip mid-run actually sounds quite refreshing. Matt Taylor, founder and CEO of Tracksmith, says one of his favorite summer traditions is planning an easy day's run around jumping into a body of water. "It’s a nice way to break up training, a fun way to explore, and just sometimes the only way to get through a really hot run," he says. Only problem is, a run-cannonball-run is hard to dress for. "We tried running in swim trunks, but those aren’t designed for a runner’s stride and chafed after a mile or two," he says. Not to mention, few options exist for women who want to swim in shorts. "So, we wanted to build a short that brought together the quick-drying and water-repellent properties of a suit with the silhouette and function of a running short," he says. They ended up with a short made from stretchy, hydrophobic nylon, meaning it won't get water-logged or weighed down. Unlike other running shorts, these are stretchy, meaning they allow for more range of motion and won't stick to your legs when you're wet, he says. The fancy outer fabric is nice, but "a running short is only as good as its liner," Taylor says. Tracksmith worked with Speedo to develop a liner that was made from swimsuit material, but could dry quickly and feel comfortable for runners. But is it actually comfortable if you're already sopping wet? 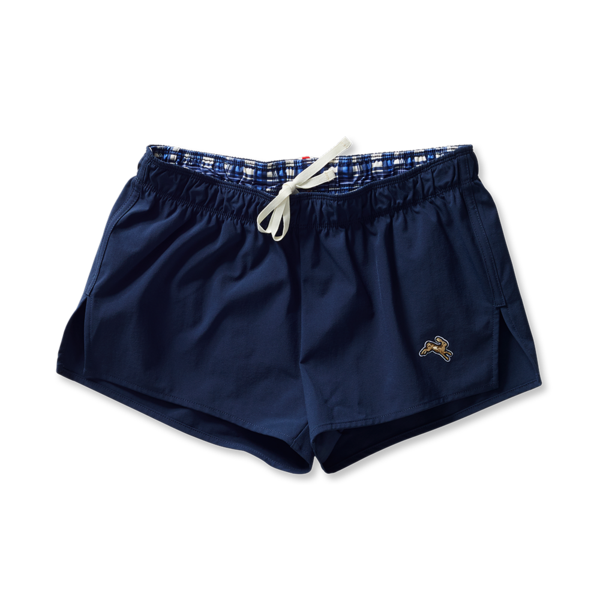 Testing these shorts in New York City was a bit of a challenge, because there are not readily-available bodies of water. Instead, I opted to run about three-ish miles from Bed-Stuy to Williamsburg, because I had seen photos of the fun water feature at Domino Park, the new park along the water. The weather wasn't super hot, but it was humid, so by the time I arrived at the fountain I needed a cool-down. The fountain was cute, though I was surrounded by children in bathing suits and couples taking engagement photos. I jumped right in, fully dressed, sneakers and all. It felt pretty stunning, and I would definitely plan a run around water again. But then I was soaked. I trotted around Williamsburg dripping, too embarrassed to enter any establishment until my shorts dried. It took about 10 minutes for the outer fabric of the shorts to dry, but the inner liner stayed pretty wet through my subway ride home (yeah, I didn't run home). My colleague Rebecca Farley, an entertainment editorial assistant at Refinery29 who is an avid runner, also wore the shorts on the treadmill and in an indoor pool at a YMCA in Brooklyn because it was raining. While she liked how they felt in the water (not too billowy), she agreed that it took forever for the liner to dry: "It might just be the humidity in New York City right now, but the underwear liner never fully dried," she said. "My nethers were damp for the next 30 minutes." We also both thought the liners were too thick. While the drying time was a bummer, there are still some redeeming qualities to these shorts. The outer fabric is very lightweight and comfortable, so they'd be perfect for running on the beach or hanging out in the summertime. But if you have plans to submerge yourself in water, you might want to just wear a bathing suit. *Tracksmith provided Refinery29 with the product for testing purposes. So, should you get these shorts? They're $88, which is pretty expensive for a pair of shorts. If running and swimming is part of your regular routine, then you might be able to justify it. But for those looking for a solid pair of running shorts, you should consider Tracksmith's Van Cordlandt Shorts, which are cheaper (and happen to be Rebecca's personal favorite). Or at the very least, consider some workout underwear that you can count on drying fast.